BLACKSBURG, Va. (AP) — Virginia Tech quarterback Josh Jackson has a broken left fibula and will have surgery. Coach Justin Fuente made the announcement Monday. The coach said the surgery will take place Tuesday, but gave no timetable for how long Jackson will be sidelined. 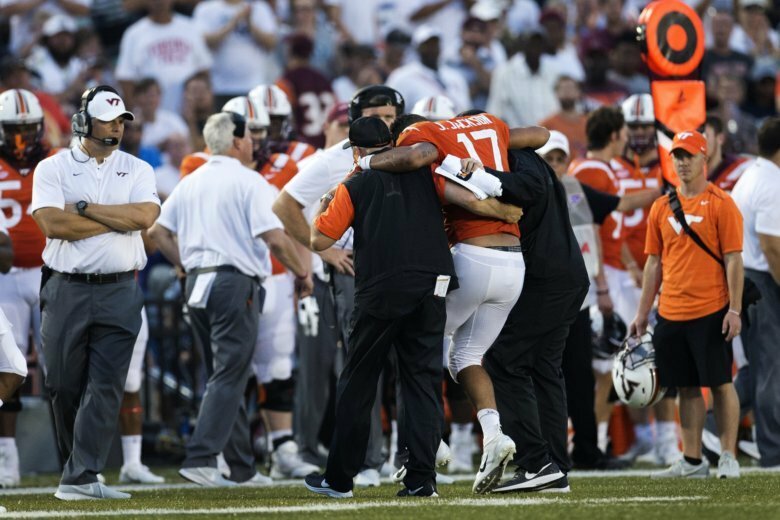 Jackson, in his second season as the starter, was injured in the third quarter of the Hokies’ 49-35 loss at Old Dominion on Saturday night. Redshirt junior Ryan Willis replaced him and was 9 for 18 for 131 yards with a touchdown pass. He also ran four times for 30 yards. Jackson set Hokies freshmen records last season by throwing for 2,991 yards and 20 touchdowns. He was 36 for 58 for 575 yards with five touchdowns and one interception when he got injured at the end of a 19-yard run. He was carted off the field and returned to the sideline later on crutches and with his leg in a protective boot. Willis, a transfer, started eight games as a freshman and two as a sophomore at Kansas before transferring.